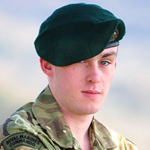 Nigel Mead joined the Royal Marines on 27 October 2008, aged 17. It was Marine Mead’s first employment after leaving school, and he enjoyed the demanding rigour of the Royal Marines. He passed fit for duty as a Royal Marines Commando on 3 July 2009, as an original member of 977 Troop. He was the youngest marine to pass out from his troop. On completion of training he joined 8 Troop, Lima Company, 42 Commando, based in Plymouth. He was involved in a number of high tempo and demanding tactical training exercises, including a two-month amphibious deployment to the United States. 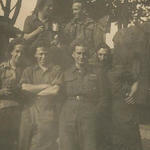 He also enjoyed wider training activities such as mountain training. He completed the full pre-deployment training package for operations in Afghanistan and in addition the long range rifle course. [Source: MOD].